Having attended the ANZAC service this morning, like so many New Zealanders across our country, I came to realise how inadequate our present War Memorial is. For a start, there is hardly any room for visitors, who have to cling to the hill side and peer through the trees. 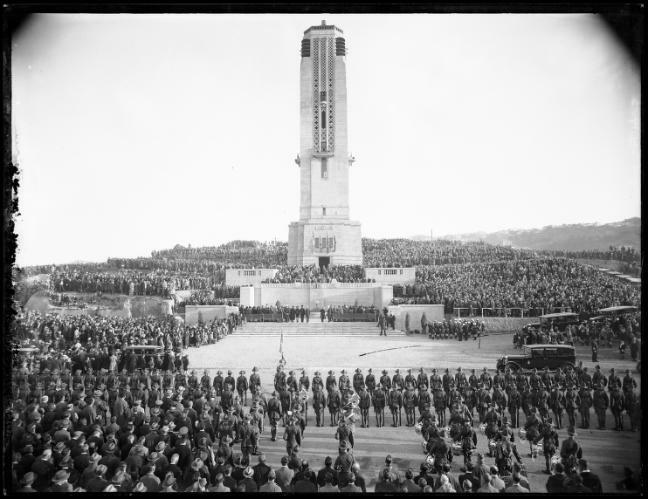 On it’s inauguration many years ago, the Carillon stood alone, proud and prominent on the base of the hillock we call Mount Cook. The crowds numbered in their tens-of-thousands. The site had previously been a site for brickworks, a jail, barracks, and more: but it was selected for its prominence over the city. Apparently, when the jail stood there, it watched broodingly over city, casting a baleful glance at the sailing boats anchored in the harbour. No doubt, in a similar manner, it was hoped that the Carillon would also be a prominent presence. A broad boulevard was planned to extend out from its base, reaching down towards the sea. However, due to the current insensitive state highway cutting across its foot, and due also to the seeming absense of any recognition in the District Plan, the view from the Carillon and the War Memorial behind it is very much less than inviting. At either side of the Memorial is a mass of seemingly ‘sacred’ pohutukawa trees, ill-affording the public anywhere to sit in peace. Immediately at the foot of the steps is the wide asphalt swathe of the multi-laned state highway, full of incessantly roaring traffic, except for a few hours break on this one morning each year. Just beyond that is the still-cordoned off disaster zone that is the proposed site for the Memorial Park, that seems to have been still-borne between Clark and Key governments. In the mid distance is a bland, mish-mash of second rate apartment buildings, only the curvilinear skyline of the Walker / Serepisos Century City standing out from the rabble. The sea is no longer visible. The hills are barely peeking out from above the buildings of the city. We seem to dishonour our war memorial with apparent impunity. There are a number of things we can do. 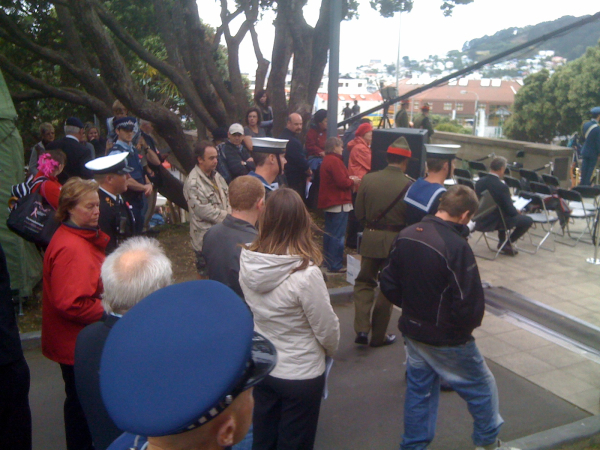 First up, the excellent recent news (but still unconfirmed) that SH1 may be trenched to go past the War Memorial, so permitting the traffic to flow smoothly, and the peaceful and respectful nature of the Memorial to be observed. Handily, it fits in perfectly with the contours of the site, so we look forward to that being confirmed. Secondly, those ‘sacred’ trees each side of the steps – really, they’re a bit of a nuisance, and some need to be removed. Forthwith. There is nowhere to stand, sit, or even observe. Thirdly, that swathe of asphalt and silly fencing that stands in front now, desperately needs to be made into a park. There was a competition once – who won it? I never saw an announcement. Whatever – whoever – something needs to be started on that now. Fourthly, but by no means the least, the District Plan view-shafts around the Carillon and War Memorial need revising. They seem nonsensical. For a start, you can’t see through the trees, but secondly, the prospect of buildings rising 10 stories in the air directly in front of the Memorial seems so wrong. Height limits from the steps of the Memorial all the way down to the sea need to be revised so that more towers don’t block off the vista. Not sure that there would be anything worse than saving the immediate vicinity of the Memorial for a Park, only to block it all off with an eyesore after all that. If only the originally planed boulevard leading from the steeps straight down to the foreshore had come to fruition. Alas the proximity of the already established Tory St made it a non starter all those moons ago. But what a difference a major road leading up to it instead of cutting across it would make. I agree about the trees, maybe if the park goes ahead all the extra green will compensate enough for a serious bit of tree trimming. The city has grown up around the Carillon since its inception as a place of remembrance and reflection. Short of a major earthquake to return the sea views at the memorial, how about we exhume William Massey’s corpse off the end of Miramar and move the Carillon there? The excess trees could be moved to the new park in front of the Carillon. Similar trees were moved to Te Papa. 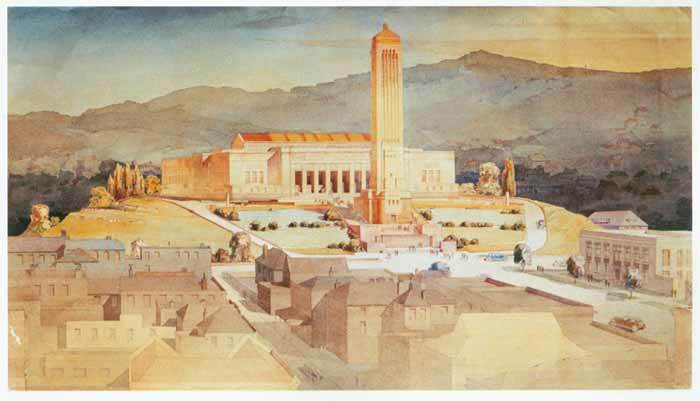 I’m all in favour of adaptive re-use and everything, but seeing the Gummer rendering of the whole Mt Cook complex makes me sigh for the opportunity lost when the National Museum and Art Gallery were abandoned as part of the Te Papa establishment. While there’s good reason to fret about the messy foreground, the breaking of the connection between the carillon and the building behind it is almost a bigger shame. Together they made an almost acropolian combo – suprema a situ, in fact. Not quite the same with a thicket and a carpark for a hard-working university. dylan – easier said than done. They’re very big, quite old, and multi-branched. Plus, the hillside is on a 30 degree angle and they have their toes in under all the steps etc – moving them would involve a huge degree of smashing up everything that is already there. Trust me on that one. Then again, I don’t think that cutting them all down is the answer either, and there would be howls of pohutukawa rage at the mere mention. But perhaps it is time for the scope of the ‘Memorial Park’ to be widened, to extend from the doors of the old museum right down to the Mt Cook school fence. Starkive’s got a point – the view behind is just as botched as the view in front. Ever since the concept of Memorial Park was raised I’ve been completely of the view that the Park had to connect with the Carillion and Tomb of the Unknown Warrior, which means SH1 had to either go underground (preferred option) or move north towards the school. Putting it underground may also give some opportunities – albeit expensive to improve the way we get traffic across the whole Te Aro flat. I also think it is a shame that we have two war memorial sites, Carillion and Cenotaph so widely separated but there’s obviousl not much we can do about that now. I fancied the area between Parliament and the Old Government Buildings as potentially filling the ‘centre of our nation’ role. 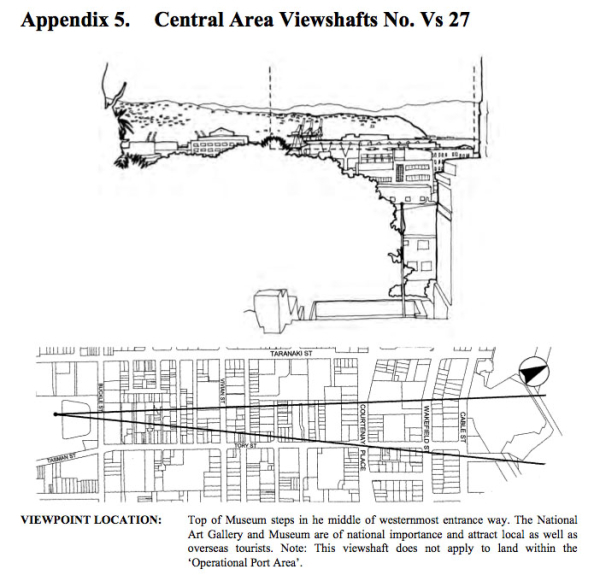 yes, there are two viewshafts in the District Plan at present, from the Museum – but have you had a look from those viewpoints lately? They don’t actually work at all. They clash badly with buildings, trees, and Tory / Taranaki St as well. Plus, surely what is more important is that we can see the Carillon and Memorial from certain places in the city, as we can from the exit of the Mt Vic tunnel. That’s a viewpoint that is currently not protected in any way. Who’d a’thought a we’d hear calls for a nostalgic dictatorial Beaux-Art style, real world and topographically ignorant, axial alignment right here in whatever technological age we are supposed to be in. I knew that urban design was a little Romantic at heart (in a positive way), but this is bordering on the ludicrous. oooOOOooo who pushed your button ? ‘Bordering on the ridiculous’? Yes – bordering on the ridiculous. I’m not advocating status quo, but nor am I promoting a return to a past future that never eventuated. Surely we are not that bereft of design talent…? Today’s borrowing of mid-twentieth century architectural aesthetics is one thing, without digging back even further for an aesthetic ordering system to rearrange a reality that is a far cry from the situation of 100 years ago (or thereabouts – the precinct was always dated, right from its conception). And why the glorification of war as an avenue for the aesthetic reorganisation of the city. Don’t get me wrong – kudos for all those who paid for their beliefs with their lives and all, but the 19th and first-half-of-the-twentieth century nationalistic jingoism around grand memorials is a reflection of the very attitudes that led to Old World war-mongering in the first palce. Dawn parades, memorials etc – sure, fine, but don’t go spending billions of ratepayer money trying to turn Wellington’s urban fabric into a celebration of one of mankind’s greatest follies, please. All but one of the urban designers are either gone or going via redundancy. Apparently the replacements are from Auckland, the management are all from Australia via Manukau, and apparently they have a totally different view of how urban design and planning “should be done”. There certainly can’t be a lot of enthusiasm left at WCC for the romance of urban design right now. The loss of collective knowledge at WCC in the last year has been phenomenal. (Not to mention the redundancy payouts…) The urban design team seems to have been hit particularly hard. Who knows what is in store for Wellington in the future? m-d you have, as always, raised an interesting issue in terms of design. Your objection appears to be one of avoiding a Faux-Beaux-Arts tableaux, while still acknowledging (albeit not celebrating) the sacrifice of the ideals and respect behind the monument. But what modern architectural idiom can do this justice? I’m sure there are many – a liebeskindian clash would express the discord of war, while a hadidian swirl would be appropriate for the hope for future generations, and – hell, who knows what else we would get if we held a new competition. Oh that’s right, we already have had one. Which no one knows the result of. I think, therefore, given that the ground rules (ho ho ho) have changed, it is time for a NEW competition ! This time I am sure the pot-stirrers will know when to shut up and accept what the community has been gunning for for years – a cut and cover tunnel that will allow a road-free, uninterrupted urban space flowing from the base of the steps, that is still functional for events such as ANZAC Day. As has been mentioned on here before, WHY are they not carrying out an archeological dig now? Dig up all the important china/dolls/keys/bricks/shoes/bottles/foundations/food scraps/bones, back fill it and grass-seed the bloomin’ thing. It’d be better than the skate-park it is now! The undergrouding of Memorial Park and the cut-and-cover around the Basin seem to be gaining almost universal support in the city, so hopefully NZTA will see the light and act accordingly. However the fate of the car park behind the Carillon does seem to be a bit of a mystery to me. Is the intention to remove that car park altogether, thus having an uninterrupted Memorial Park, or will there still be a strip of tarmac weaving its way through so the students don’t have to walk too far from their conveniently parked cars? Does anyone know? No, the actual ‘memorial Park’ is restricted to the empty area where the old gas station etc used to be. The land by the Museum all belongs to / is used by Massey. And I don’t know if they even think there is a problem. Don’t know about your universal agreement comment! No indication yet that the gov is keen to pay. They may say it is a WCC problem. Thanks JCB … it would be a bit of let-down to spend $50m undergrounding the road, and then discover that there was still an access road for the car park snaking up beside the Carillon. Surely there is a better solution than that, and surely Massey can be encouraged to find it! My understanding is that the land and buildings belong to the Wellington Tenths Trust who purchased them from the Government with the proceeds of the Te Atiawa Tiriti settlement in the late 1990s. Massey have a lease which certainly includes some of the grounds, but I am not entirely sure where the boundaries are. Would be beyond ironic if the forecourt were to be compulsorily acquired under the Public Works Act to extend the War Memorial.